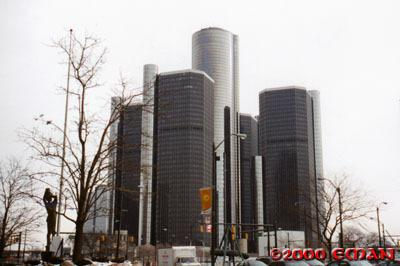 DETROIT, MI (January 15, 2000) -- Maybe it was because I had gone to the Frankfurt autoshow last September. Maybe it was all the hype for this show. Maybe I got up too early that morning. Or maybe because there seemed to be only trucks at the show. In any case, boring is the best way to describe my reaction to this year’s autoshow. I know I’m generalizing a bit here. There were a few cars that I found interesting, but over all, I thought it was a boring show. SUV - SUT - SAV - whatever seemed to be everywhere. Apparently, this was exactly what the people were looking for, too. Take a look at the Acura NSX below. I know the design is a bit dated, being 10 years old. But if you look closely, you can see tumbleweed blowing across the stand. This whole area was deserted. Doesn’t anybody care about 8,000+ rpm, mid-engined sports cars anymore...? ~ Biggest Letdown: What ever happened to the alluringly-clad female spoke-models?